Barbara Gordon is Batgirl. Even though the Joker doesn't know this he deals a potentially deadly card to the Bat family by singling out Barbara as a means to get at Commissioner Gordon and in turn Batman. Will Gordon stoop to the Joker's level and exact revenge? The classic Batman tale by Alan Moore and Brian Bolland returns in this all-new special edition celebrating the 20th anniversary of the landmark work - features all-new coloring by Bolland. Perhaps one of the best Joker stories, my recommendations!! One of the first Batman's comics i ever read. Great, a classic! This book is simply beautiful. I have considered buying this book for some time but as an artist I find the original out-dated colouring grinds on an artistic nerve that I just cant stand (kind of like watching Avatar if it had been filmed with a handy-cam bought from Kmart) so avoided buying it all together even if it went missing out on a brilliant story. So when I found out it had been recoloured I jumped at the chance to grab it, and my God I was BLOWEN AWAY! This book is so gorgeous, the new colouring makes it look EPIC, takes it to the level of all out Blockbuster. All in all its a lovely looking book. The story is brilliant of cause as we all know, its a classic and a must have and always has been story-wise but now with the new look modern colouring look just buy it even if you have the original. You will be in awe. Short and sweet, but the new colourist is a little overzealous in his bringing this classic to life in a more modern way, and something is lost in the process. Updating and revamping old books like this is a good idea in theory, but often not in practice. A classic Batman story that had (and continues to have) a huge impact on Batman's world. The art has been recolored by Brian Bolland in this edition, so it looks more modern. 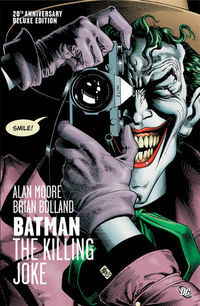 It's one of greatest Joker book I ever read (before The Joker graphic novel). I give this book two thumbs up. When I opened to the first page and saw how this comic was drawn, I was in awe. The art is so modern, I was shocked to find out it was printed in the 80's. Taking the cover sleeve off, I saw the coolest cover. This was a great way to commemorate (one of) the origin(s) of The Joker. If only there were a better rating than "5 stars", because this book deserves a higher honor. This is so much more than a simple graphic novel- it is a study in insanity, and a beautifully drawn piece of comic art. Being one of the only non-TPB graphic novels to actually influence the modern continuity, The Killing Joke rips out the very heart of Batman's essence and pumps it with the steroids of awesome. From the very first panel, the reader is hooked. The little surprise at the end- a newly-colored exerpt from the pages of "Batman: Black and White" serves as an unrelated -yet somehow quite fitting- epilogue. This is simply modern comics at its greatest. Greatest batman graphic novel ever written. I bought this book back in 1989 but could only find a 3rd printing back then. Anyways, its still rather difficult to find because its so good. This is one of the best Joker stories if not best Batman story ever told. Bought this item for a gift, big hit! Legal Notice: Entire contents trademarked (® or TM) and copyrighted (©) 1986-2019 by Things From Another World, Inc. and respective copyright and trademark holders. All rights reserved. Page rendered at 2019-04-25 18:54:27 in 0.270 seconds.